The Speck Blog: Environmental Justice Meets Citizen Science Tech! Environmental Justice Meets Citizen Science Tech! This week, we announced something that's never happened before - a national program where we give air quality monitors (for free!) to all libraries who agree to lend Specks to their patrons! We believe that clean air is a human right, so we've developed this program to improve access to air quality monitoring and get Specks in the hands of those who otherwise might not be able to afford them. Our goal for this national library program is to change the relationship between all citizens and the air pollution that affects their health. Together with you, we can take a major step in this direction by improving equitable access to Speck air quality monitors across the country. 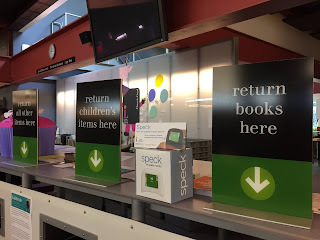 We are offering 3 free Specks, informational materials, and training to public libraries that agree to make the Specks available on loan to their patrons. Our goal for this program is to engage with awesome individuals like you to build a community of local experts for Speck and indoor air quality in general. Pairing this program with our National Library Program also has the added benefit of providing local support for libraries as they explore ways to introduce Speck to their patrons. Upon admission, you will receive 1 free Speck! What does air quality and hockey have in common?